Hi! My name is Abby Nieman and I am a Sales Consultant at Lichtsinn RV. I have lived majority of my life in the North Iowa area. My husband, Nick and I spend most of our time raising our 8-month-old baby boy, Rhys! As a family we love spending a lot of time outdoors fishing and boating. I love getting to know all our guests and hearing about their travel adventures. Seeing their enjoyment when they find the perfect RV for their lifestyle makes it all worth it! I studied at the University of Northern Iowa and received a certification from Sobel and Associates for Customer Service Training. "I greatly appreciate Abby's assistance in researching my concerns and obtaining answers to my technical questions as my salesperson during my recent purchase of a new Travato GL. She was absolutely helpful, friendly and professional throughout the sale. The entire Lichtsinn Team was extremely customer focused during the purchase, orientation and delivery processes. Technician Brett conducted a thorough orientation and repaired the few issues discovered in about an hour or so the same afternoon. Business Manager Kevin Breister was prompt and efficient in conducting the transfer of ownership. In addition to being picked up at the Minneapolis Airport by driver Gary, I was pleasantly surprised that the car was dedicated to my use during the entire delivery process, three days in my case. 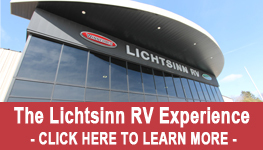 I highly recommend Lichtsinn as the premier place to purchase a Winnebago Motor Home. " "Beautiful, clean facility with very friendly and accommodating staff. Abby continues to follow up with any questions or concerns. " "Constant communication from Abby and the service team was great. Everyone was friendly, knowledgeable and excellent customer service. The ability to stay on-site overnight while we acclimated to the RV was amazing. As new RV'ers this was invaluable to us. " "Abby answered all our questions with excellent communication and her availability to help us out!" "We really enjoyed working with Abby to purchase our first RV....a View 24V...thank you to everyone we worked with: Abby for her excellent communication, Kevin for the paperwork, Brett on how to use everything, Hannah on correcting a little paint flaw, even Ron for touching base a couple of times during the process. We spent over a year shopping and picked Lichtsinn RV for there clean, friendly, professionalism. We had great trip home to Wisconsin and look forward to spending some time on the road this fall and winter!" "Abby was professional and polite, she promptly addressed and resolved any issues that occurred. We would not change a thing with our experience from Abby." "We purchased a Winnebago Brave from Lichtsinn RV. We ran into Ron Lichtsinn who was aware of us and our purchase. He provided details about the motorhome and some history. Very impressive. In addition, our sales associate Abby was great, as well. Always very helpful, smiling all the time. We purchased the used motorhome as is. Nonetheless, Lichtsinn identified a couple of things that needed to be corrected and corrected them. What a great overall experience from a class operation." "My experience dealing with the Lichtsinn RV dealership, led by Ron, has been totally over the top! We live in California so all the communication was by text and e-mail. The response time to my questions was phenomenal , and yet the feeling I got was helpfulness- not ever hard sell! Ron turned us over to his sales consultant Abby Duregger. A seamless transition. We were sent pictures of actual units, pages from the sales brochures, color variations, options, etc. We had her cell phone and I could reach her when the nervousness about a potential purchase set in. My husband and I felt like we had our hands held by her the whole time - yet- again I say - nothing pushy or overbearing for the “sale”. Polite, friendly, knowledgeable is how I would sum up our experience dealing with Abby and Lichtsinn RV. Thank you!"